The first hotel on this site was a brick building, and took its name from the original proprietor Mrs Margaret Mackay. It was replaced later in the nineteenth century by the existing ornate late Victorian hotel in the mannerist style. 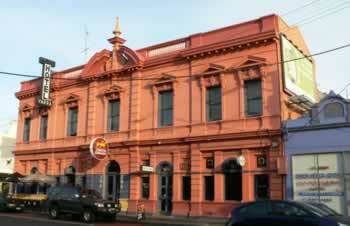 Victoria has a number of Italianate hotels built around this period, but the Yarra is an outstanding example due to the scale of its distinctive pediment and rendered ornamentation, which remain largely intact, although the painting of the render work is to be deplored. It stands in a section of Johnston Street that nowadays has a limited number of interesting buildings and a steady stream of traffic, and it might be easy to miss this architectural delight unless you cross to the opposite footpath and take a good look upwards.